Memorial Day marks the beginning of the summer vacation season. Where I live, it means lots of tourists from now until Labor Day. When I think of Memorial Day, I think about the men and women who have paid the ultimate price on the battlefield protecting our freedom as americans. I think about the beautiful and serene Bolestown Cemetery, where lies the remains of many of my ancestors from before and after the civil war. My great, great, great, great grandfather, James Boles, is buried there. He was a revolutionary war soldier, who fought in the battle of Kings Mountain. His son, my great, great, great grandfather, John Boles, is also buried there beside his wife, Matilda. He was a Union soldier in the service of Tinker Dave Beaty's Independent Scouts. She was Tinker Dave's sister. John's son, George, my great great grandfather, was also a member of Tinker Dave's group, as was his brother Robert. They were not killed during the war, but no doubt witnessed a few skirmishes where soldiers or civilians were killed. 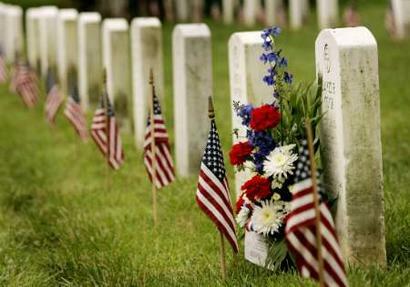 Decoration Day, as it was first known, was first enacted to honor fallen Union soldiers of the civil war. One of the earliest known observances happened after former slaves had converted a mass grave at the former Washington Race Course, now Hampton Park, in Charleston, South Carolina, into a cemetery. The race course had been used as a temporary Confederate prison camp. When the hostilities ended, the former slaves exhumed the bodies and reinterred them properly. They built a fence around the graveyard and declared it a Union graveyard. On May 1, 1865, a crowd of up to ten thousand people, mainly african-americans, marched to the location for sermons, singing, and a picnic. It was the first Decoration Day.